Three finalists have been named for the 13th Annual Dr. Tony Ryan Book Award, which honors the best in thoroughbred literature each year. The award, which includes a $10,000 prize, will be announced on Wednesday at an invitation-only event at Castleton Lyons Farm near Lexington, KY. The judges for the award were Kay Coyte, former manager editor of the Washington Post-Bloomberg News Service; Caton Bredar, television broadcaster and racing analyst; and Jayne Moore Waldrop, a writer, attorney and author. A trainer and, more importantly, a loving father, follows his son’s year as an apprentice jockey in pursuit of a dream, as he attempts to break into a tough, often unforgiving industry. This eloquent journal serves up a heart-warming story of life, love, and family, told with gentle humor and insight. A portion of proceeds from the book fittingly goes to benefit disabled jockeys. Plattner, who won this award in 2015 with “Offerings from a Rust Belt Jockey,” was back again in 2018 with another literary gem. This time, it was a collection of character-driven short stories, plus a novella, that brought to life the complex, often flawed people who populate a racetrack. Plattner, a multiple award winner outside of racing, does not shy away from the sport’s darkest corners, as several of his well-crafted tales focus on the devastation wrought by gambling addiction. A pair of well-known national journalists teamed to tell this Cinderella tale of 1940s superstar Stymie and his legendary trainer Hirsch Jacobs. It is the story of a Plain Joe colt that nobody wanted, born as a world war simmered, who rose from low level claiming ranks to Hall of Fame status while becoming the first American Thoroughbred to surpass $900,000 in earnings. With his flamboyantly high-headed, “out-of-the-clouds” style of running, Stymie became a blue collar hero to millions during America’s Golden Age of Sports. Bourbon & Barns recently caught up with Brian Haara, author of the new book Bourbon Justice: How Whiskey Law Shaped America. Attentive readers may remember Brian is a Louisville attorney, history fan and bourbon enthusiast who writes the Sipp’n Corn blog (now found at www.brianhaara.com). He even kindly shared a very interesting post about the Bottled in Bond Act with this blog last year. Bourbon & Barns: Brian, I understand you are an attorney in Louisville. Can you tell us a little about your background? Does any of your law practice concentrate on the bourbon industry? What does that entail? Brian Haara: I moved to Kentucky in 1993 to attend law school at the University of Kentucky, and then moved to Louisville in 1996 and began practicing law. I’ve lived here ever since. I solve problems for businesses and entrepreneurs, whether they’re involved in litigation or they’re trying to avoid litigation. In 2007, along with two of my law partners, we broke off from our old firm and founded Tachau Meek PLC, which is a business litigation boutique firm. I like to imagine that we’re the type of firm that Col. E. H. Taylor, Jr. would have hired for his overabundance of litigation. And yes, that means that part of my practice involves representing clients who own distilleries, who are employed at distilleries, and who need legal advice on distilling, blending, or selling spirits. Part of that involves bourbon trademark litigation, which happens to be a prominent part of Bourbon Justice. B&B: So what compelled you to write this book? Was there a particular case that sparked your interest? BH: I stumbled upon Pepper v. Labrot, a bourbon trademark case from the late 1800’s, in 2013 and I was hooked. I have always been a history fan, I had been a bourbon enthusiast since before it was cool, and suddenly I found a case that blended history, law, and bourbon. So I researched more and was fascinated by what I found and how often it told a different story than the standard marketing line. My first step was starting my Sipp’n Corn® blog almost immediately after finding Pepper v. Labrot. I wanted to share my newfound discovery that dusty bourbon lawsuits tell the story of historic brands while also leading the development of American commercial law and telling the story of our nation. I learned that bourbon and history go hand-in-hand and that I could rely on historic lawsuits from the late 1800’s and early 1900’s to provide proven facts that were found by courts to be reliable, as opposed to notoriously unreliable oral history and marketing legends. Then I discovered that bourbon is still at the leading edge of commercial law and governmental regulation today, and with a little encouragement from readers, I realized that other people found this perspective interesting too. Writing a book was always the ultimate goal; I just needed to research enough material first and find a way to tie it all together. B&B: You've written previously on this blog about the Bottled in Bond Act and its impact on the bourbon industry and beyond. Are there other cases and laws that have as broad and longstanding an impact as the Bottled in Bond Act? BH: The Bottled in Bond Act—even though the finer details have changed over time—is one of the mainstays of American law. It was our nation’s first consumer protection law so it deserves its place of prominence not just in bourbon lore, but also for American history. Bourbon Justice covers other cases that had a lasting impact on American history too, like establishing and expanding trademark rights, setting limits on the ability to use your own surname in business, protecting people from unreasonable searches and seizures, fostering workplace safety laws, and much, much more. Bourbon law really provides the fabric of today’s laws. I included “Beyond Bourbon” features in Bourbon Justice that tie some of the historic bourbon lawsuits to current-day commercials and advertising that we’ve all seen—and which have caused recent legal problems for brands like Victoria’s Secret, Listerine, Papa John’s, and Skechers. Historic bourbon lawsuits set the stage for laws impacting all of today’s advertising, but nothing else can match the Bottled in Bond Act. B&B: The Prohibition era is certainly a landmark moment in bourbon history as well as American history in general. Does your book address Prohibition? What do you think are some of the lessons we can take away from Prohibition? BH: Yes, Bourbon Justice addresses Prohibition, but I decided to take a different approach since it has been addressed so frequently by others. Bourbon Justice looks at Prohibition through temperance-biased judges who let those personal or political or moral views influence the outcome of cases against distillers. I also dive into how Prohibition led to more merchant bottling after Repeal and how Prohibition-era laws still impact spirits regulation today. 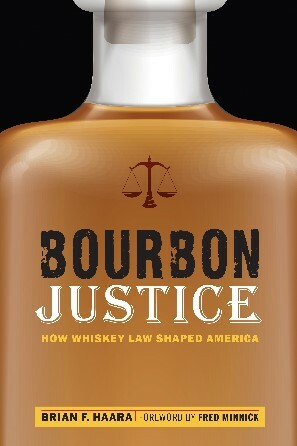 Bourbon Justice tries to avoid getting too caught up in lessons so that readers can draw their own conclusions and parallels to today’s world, but personally I believe that the unmitigated disaster of Prohibition should teach Americans about the dangers of legislating morality and the danger of nanny-state politicians. Our country is based on freedom, not on big government suppression of freedom. B&B: What was your research process like for this book? What surprised you most during the course of your research? BH: My research for Bourbon Justice started much like research for any of my clients, which involves reading appellate court decisions, but I realized pretty quickly that I needed to explore the underlying facts more thoroughly. So my wife, Laura (who is also an attorney), went to the Kentucky State Archives in Frankfort, Kentucky, which houses old court files that survived fires, floods, and document purges. What we found was amazing—original deposition transcripts; original trial exhibits; original evidence; and original affidavits. This gave me exactly what I needed to tell historical stories instead of dry history lectures. And that’s what led to my surprise—current-day brands do not always tell these intriguing historical stories, but instead some of them get too wrapped up in marketing and exaggeration. Truth is better than fiction for most storied brands. B&B: Please add anything else you'd like to add. BH: Did you know that the phrase “brand name” originated with bourbon? Or that the federal government apparently cared less about protecting citizens from dangerous products and adulterated food than it did ensuring that whiskey was pure? This is the sort of information that I found preserved by bourbon law, possibly along with the true history about your favorite bourbon brand. I never expected bourbon law to be such a bountiful resource beyond just bourbon, and I suspect that’s why Bourbon Justice has been so popular outside of niche bourbon and legal circles. Wilderness Trail Distillery has added rye whiskey to the award-winning selection of spirits from the craft distiller in Danville, KY. The distillery made one barrel of its cask-strength Settlers Select Kentucky Straight Rye Whiskey sold in a collectors’ box available to the public at its visitors’ center earlier this month. Additional bottles without the collectors’ box have been made available to retailers. According to the distillery, the whiskey has a mash bill of 56% rye, 33% corn and 11% malted barley and is aged in a #4 char barrel. The distillery plans to age their ryes 6-8 years like their bourbons, but also plans to release some cask-strength ryes (such as this one) as well. For more information about this whiskey and all of Wilderness Trail’s spirits, check out the distillery’s website at http://wildernesstraildistillery.com/spirits/?age-verified=fbdafda664. There is no beverage more American than Bourbon. In fact, Bourbon is officially known as “America’s Native Spirit.” So what exactly is it? (Well, there are a couple rules about how much alcohol it can contain during the process, but that’s a more complicated topic for another day). Grains and barrel-aging produce a wide variety of flavors such as caramel, cinnamon, nutmeg, orange, cocoa, oak and more. Try a Bourbon today and see what flavors your palate can detect! FUN FACT TO IMPRESS YOUR FRIENDS: Kentucky is synonymous with Bourbon for a reason. The Bluegrass State produces 95 percent of the world’s Bourbon. In fact, Kentucky produces so much Bourbon that the state actually has more barrels of Bourbon than people! Bourbon takes patience, but the wait is finally over at New Riff Distilling. The Northern Kentucky distillery has released its first distilled bourbon, a bottled-in-bond release the distillery describes as a "sensorial symphony of butterscotch, rye spice, vanilla and fruits." This high-rye bourbon is the first release distilled at the Newport, KY, distillery, which opened in 2014 and is located a short drive across the Ohio River from Cincinnati. The distillery previously released O.K.I. bourbon, which was distilled off-site but aged and bottled at New Riff. The bottled-in-bond release, which follows strict federal requirements, will be New Riff's baseline spirit, rather than just one part of its portfolio. Readers of Bourbon and Barns may remember last year's Q&A with New Riff General Manager Hannah Lowen. Read that interview here: New Riff Distilling Excels with Patience. Bourbon and Barns has also explored what it means for a bourbon to be "Bottled-in-Bond." You can read more about that in a piece originally posted by Louisville attorney Brian Haara on his Sipp'n Corn blog: Bourbon Propels Early Consumer Protection Law. New Riff Distilling, a Northern Kentucky distillery offering a new riff on American whiskey, today announces the release of its Bourbon that has been patiently aging for four years. 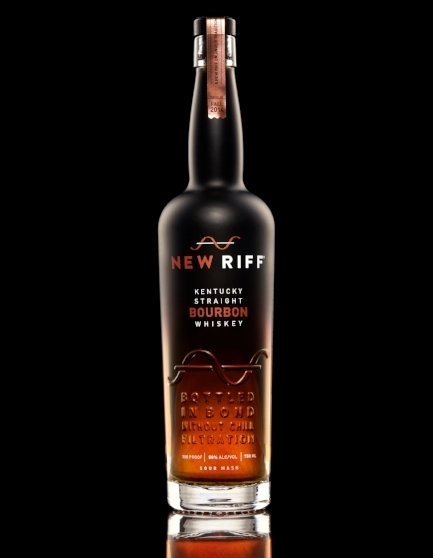 Distilled by an expert beer brewer-turned-distiller, New Riff Bourbon will be available in spirits retail stores, bars and restaurants beginning in Fall 2018 (SRP $39.99/750 ml). Bottled in Bond at 100 proof (50% ABV) without chill filtration, New Riff Bourbon embraces the ultimate quality benchmark for the category. A genuinely high-rye, full-bodied whiskey with a savory, spicy character, its mash bill is 65% corn, 30% rye and 5% malted barley, all non-GMO. New Riff Bourbon entices with an aroma of butterscotch that rounds into fresh oak, with hints of vanilla and rye spice. On the palate, its broad, fulsome mouthfeel leads to a sweeter vanilla accent, before a melding of clove, cinnamon, mint and dark berries. Its long, rye-led finish is replete with brambly red-black fruits amid white pepper and clove. New Riff Distilling’s Bourbon is Bottled in Bond, meaning the whiskey was made in a single distillation season by a single distillery. It must be aged for a minimum of 4 years in a bonded warehouse, and be bottled at exactly 100 proof; no flavors or colors may be added, and the whiskey must remain unchanged from the barrel except for filtration, which is permitted. This is in accordance with the Bottled-in-Bond Act of 1897, which was enacted by Congress to stop the rampant adulteration of American whiskey at the time. It has since become a watchword for quality, since blending is prohibited and the distiller’s skills are in full view. In light of all the regulatory requirements, many producers reserve Bottled in Bond for only select whiskeys in their portfolio. New Riff Distilling has chosen to make it its baseline. Moreover, it is adding its own quality guarantee, namely “Without Chill Filtration.” This ensures that nothing is removed from the Bourbon, not even through filtration, retaining all the aroma, flavor, texture and color. To build their distillery, Lewis, who previously owned the nation’s largest spirits retail store, The Party Source, and Erisman, who was the store’s Fine Spirits Manager, reached out to Larry Ebersold, an unrivaled authority in American whiskey with four decades of experience at Seagram Lawrenceburg Plant in Indiana, at one time the largest distillery in the world. As Consulting Master Distiller, Ebersold played a pivotal role in commissioning the new distillery, including specifying its equipment and ensuring that everything functioned seamlessly and safely. Ebersold recommended Lewis and Erisman hire someone with beer brewing experience, rather than a distiller, to run the new operation. He reasoned that all of a spirit’s flavors are created during fermentation, a process that brewers know intimately. This resulted in recruiting Brian Sprance, formerly of the Boston Brewing Company, as Head Distiller. Ebersold trained the nascent team in distillation techniques and shared his prized mash bills that became the starting points for New Riff Distilling’s own recipes. He remains a mentor and constant inspiration for the team. When planning the distillery, Lewis and Erisman sought a better source of water than the local municipality. By luck or kismet, they discovered the distillery’s location is situated directly over the Ohio River Alluvial Aquifer, which has some of the best water in all of Kentucky. Located 100 feet below ground, the aquifer’s water is naturally filtered, loaded with minerals and at an ideal constant temperature of 58 degrees, even in summer. The water, which gushes forth at 500 gallons a minute, yields enormous energy savings by effectively cooling the mash and condenser coils without first requiring to be chilled. In addition, the water is used throughout the fermentation process. Wilderness Trail Distillery is celebrating the season with a Holiday Open House today and tomorrow at the distillery in Danville, KY. The event will feature discounts in the gift shop, a drawing to attend a Bourbon Science event and a special release of single-barrel cask-strength Harvest Rum. Visitors will also be able to check out the progress of the distillery's $9.9 construction project that includes a recently-installed 43-foot tall column still. Check out the press release below or call the distillery at 859-402-8707 for more information. DANVILLE, KY — In addition to drink and gift shop specials, Wilderness Trail Distillery has two exclusive offerings during its Dec. 1 and 2 Holiday Open House. For its first annual holiday release, Wilderness Trail Distillery will offer a 375 ml bottle of single barrel, cask strength Harvest Rum. This 101-proof Harvest Rum will be available only in the gift shop. The Open House also features a special drawing to participate in Bourbon Science, the craft distillery’s June 6 Bourbon Affair event. Everyone attending the Open House may register for the drawing for this Bourbon Affair event that concludes with bottling your own Bourbon in the barrelhouse. The ticket has a $150 value. During the Open House, visitors will receive 20 percent off a gift shop purchase (excluding alcohol). The gift shop has several items that relatives and friends might enjoy, including hoodies, T-shirts, glassware, books and flasks. Candleberry Candles will be two for $22. Order a signature cocktail made with Blue Heron Vodka or Harvest Rum in an etched rocks glass for $15 and keep the glass. A $25 gift certificate for a January barrel stave painting class makes a great Christmas present. The Open House provides an opportunity to view the progress of the distillery’s $9.9 million construction project. The distillery, located at 4095 Lebanon Road, recently installed a copper 43-foot tall continuous column still and six new 20,000-gallon fermentation tanks. When all the equipment is operating in early 2018, the distillery will produce around 150 barrels a day. View the new equipment by taking a tour offered during the hours of 10 am. to 5 p.m. Open House hours are 10 a.m. to 7 p.m. Dec. 1 and 10 a.m. to 5 p.m. Dec. 2. This year’s Open House also is a time to share with others. Please bring a paper good, pasta or canned good to donate to New Hope Food Pantry in Danville. Keeneland Race Course is open for its Fall Meet and there are plenty of races and events to look forward to. Located in the heart of horse country in Lexington, KY, the immaculately landscaped grounds of Keeneland are home to some of the biggest sales and races in the thoroughbred industry. Big Races (all month) - The Fall Meet is only a few days old and there have already been nine graded stakes races, including five Grade 1 races. Eight of the races were part of the Breeders' Cup's Win and You're In Series that automatically qualifies the winners for next month's Breeders' Cup. You can check out all the winners at Keeneland at www.keeneland.com/racing/results. Queen Elizabeth II Challenge Cup (Oct 14) - The biggest remaining race on the Keeneland calendar is the Queen Elizabeth II Challenge Cup. This Grade-1 race is named for the British monarch who attended the races at Keeneland in 1984 and presented the trophy. The race is sponsored by Lane's End, a prominent Kentucky breeding farm whose owner, William Farish, was the United States Ambassador to the Court of St. James (England) under President George W. Bush. Buffalo Trace Giveaway (Oct. 13) - Patrons may enter to win a VIP Buffalo Trace Distillery Experience that includes a private behind-the-scenes tour of Buffalo Trace Distillery in Frankfort, Kentucky as well as lunch with Master Distiller Harlen Wheatley. The Buffalo Trace Franklin County Stakes (Grade III) will also be run this day. You can read about all of Keeneland's promotions and events at www.keeneland.com/calendar. To learn more about Keeneland and the Fall Meet, go to www.keeneland.com. Summer Sun, a 12-foot tall structure of blown glass and steel, is one of several art installations by Dale Chihuly on display at Maker's Mark through December 3. Bourbon and Barns is happy to provide an update on a development we told you about a few months ago. In July, we reported that Maker's Mark had unveiled a unique and exclusive art exhibit by world-renowned artist Dale Chihuly. The exhibit, called Chihuly at Maker's, included a number of blown glass structures throughout the Maker's Mark campus in Loretto, KY. The exhibit has been very popular and late summer visitation to the distillery is up 40% over the same period last year. Chihuly at Maker's (the installations throughout the distillery campus) has been extended through December 3. (Included with $12 cost of admission. Free for those under 21). Go to www.markersmark.com or call the Visitor Center at 270-865-2099 for more information. Go to www.makersmark.com/chihuly for more information on the exhibition. Read the original Bourbon and Barns post about the exhibition and the installations.